When you’re getting ready to shred your files, there is a process you follow. First, you determine what types of documents need to be shredded, then you sift through your home or office gathering all your papers together. Once you have everything organized, it’s time to shred—but which shredding service is the most cost effective? The answer varies based on your project, and there are factors to consider beyond the black and white cost of the service. 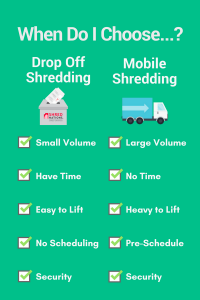 Use the factors below to help choose between mobile shredding and drop off shredding services for your document shredding project. The number one factor that will determine which service you choose is volume. Use this shredding calculator to help estimate how much paper you have. Drop Off Shredding: Designed for smaller projects weighing 100 pounds or less (about 3 file boxes worth of paper). Mobile Shredding: Geared towards larger projects weighing 100-300 pounds (3-10 file boxes worth of paper). Drop Off Shredding: The price for this service can vary by location, but it’s typical around $1 per pound for drop off shredding services. Mobile Shredding: The price to have a shred truck visit your location is around $110—so make sure you have a high enough volume to make this service cost effective. 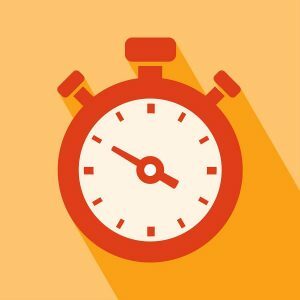 We all know time is money, so the amount of time each service will take out of your day may influence your decision. Drop Off Shredding: You have to find the nearest drop off shredding location, load up your car, and drive over to drop off your documents. Mobile Shredding: A shred truck comes to your location and shreds everything for you right outside your doorstep. Can You Transport the Paper Yourself? Depending on how many pounds of paper you have to shred, carrying and transporting your documents yourself may be easy or too strenuous. Drop Off Shredding: You have to carry your documents from your office to your car, and from your car to the shredding counter. Mobile Shredding: The shredding professional hauls your paperwork out to the shred truck for you. The flexibility of your schedule will impact which shredding service you choose. Drop Off Shredding: No advanced scheduling is required, you can simply stop by the shredding center on your way home from work or when you find a few minutes in the day and drop off your documents. Mobile Shredding: The shred truck must be scheduled in advance, anywhere from a few days in advance to a few weeks, depending on the time of year and how busy the shredding company is. While both dropoff and mobile shredding services are completely secure, some people like to watch their documents get destroyed for extra peace of mind. Drop Off Shredding: You drop off your documents where they will stay locked in a secure shred bin for a few days until all the items in the bin are bulk shredded. Mobile Shredding: You can stand right next to the shred truck and watch your paper being dumped into the shredder and churned to bits. Need a Shred Truck to Stop by Your Location? Shred Nations partners with a broad network of shredding professionals nationwide to help homes and businesses find the shredding solution that meets their needs. Use our dropoff shredding directory to find a drop off shredding center near you, or call us at (800) 747-3365 to have a mobile shredding truck stop by your location and shred your files onsite. We look forward to helping you keep your confidential documents safe.